The extended, redesigned Marks & Spencer store at Trinity Leeds opened its doors to customers for the first yesterday. More than 60 jobs have been created by the new store, ranging from customer assistant roles to management positions. The Briggate store, which has been extended by 10,000 sq ft, will now have over 96,000 sq ft of selling space, offering customers in the area even more options across fashion, beauty and homeware. Shoppers will benefit from the new 1,000 sq ft dedicated Autograph department, a new beauty section selling an extensive range of M&S’ own-brand and exclusive beauty brand products and the new 100-seat Café on the second floor, which offers panoramic views of the Trinity development. It is great to finally invite customers into the revamped store and show them what we have been working on for the past few months. The redesigned store brings the best that M&S has to offer to shoppers in Leeds. The feedback from our customers on all of the new features has been very positive so far with the Beauty section and Autograph department being key talking points. We look forward to welcoming customers into the store over the weeks and months to come. The new Autograph section connecting M&S Briggate to Trinity Leeds was launched by Paul Tyler, along with three long serving members of staff with a combined service of almost 120 years. 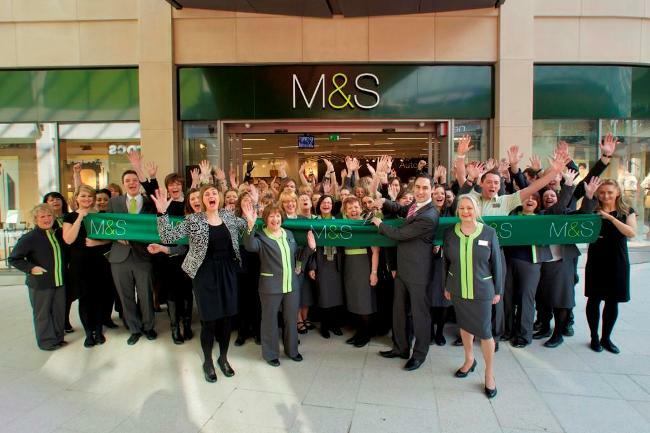 We are delighted to be a part of this important milestone for M&S in Leeds. We have seen lots of changes over the years but M&S has always been an important part of shopping in the city and are pleased to see this bigger and better store revamped and extended as part of Trinity launching.